As November approaches, we come closer to another blogging initiative–International Picture Posting Month (IntPiPoMo). 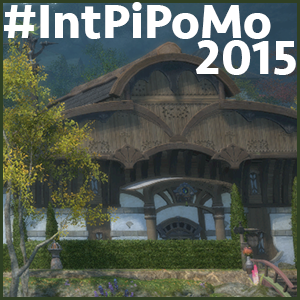 IntPiPoMo is the picture equivalent of National Novel Writing Month (or NaNoWriMo). The goal is to share fifty screenshots during the month of November. Why fifty screenshots? Moss here will tell you! NaNoWriMo is about writing 50k words throughout the month of November. If a picture is work a thousand words, that would mean we’d need to post fifty pictures! These can be screenshots from any game, or even photographs you take in real life and want to share on your blog. They can be anything–character selfies, shots of combat, sharing your game UI, showing off that awesome-tacular Deathclaw kill you got in Fallout 4… you get the idea. IntPiPoMo was started back in 2011 by Angelya of Revive & Rejuventate and was picked up in 2013 by Jojo of Admiring Azeroth. This year Jojo passed it along to me, as she is unable to run it this year due to a spectacular vacation. I’m hoping to do the initiative justice, and can’t wait to see what kind of screenshots folks post as a part of this! Participating is easy! So easy, I can break it down into a list for you. Let me know you are participating either via this post in the comments, or twitter so that I can add you to the list! You can join at any time throughout the month of November! Take the above banner and use it on your site! Link back to this post so folks know where to go and what to do! Aim to post fifty (50) screenshots throughout the month of November. There is no strict posting schedule or theme to adhere to, but feel free to bounce ideas off of the community that’s participating! Feel free to post these shots as a once-a-week photo batch, or throughout the week in small 1-2 shot doses–whatever floats your boat. Use the #IntPiPoMo hashtag when you share your blog post via Twitter. Grand Prize – Of all participants who complete 50 photos, I will be using a RNG (random.com) to draw a winner for a $15 Steam Gift Card! Three Other Prizes – Of all participants who complete 25+ photos (up to and including those who make it to 50 pictures), I will be using a RNG (random.com) to draw three winners for a $5 Steam Gift Card! All Particpants – If you post at least 5 photos during this initiative, you’ll get a special little banner denoting you as a participant! I hope that I can do the prior years justice, and I’m looking forward to the screenshots people share! Expect posts, as we get closer, with lists of who is participating! I’ve gotten some questions throughout pimping this event, so I wanted to address some of them for folks at large that are contemplating participating. Originally located in this post. Q: Can I sign up during the event itself? I don’t know yet if I can/want to participate. A: Of course! You could sign up the final day if you wanted, though I don’t necessarily suggest it. Q: I don’t want to put these on my main blog. Can I use my Tumblr? A: Yep! Tumblr is technically a type of blogging, called micro-blogging. Some people also have micro-blogs on other platforms, too. These micro-blogs are welcome as a part of the event! Q: You mentioned photography being allowed, but, what if I wanted to share some artwork throughout the month. Can I use it as a part of my submissions? A: Most definitely! Whether it’s digital artwork, sculpting, etc. I think any form of creativity (outside of words) can tell just as much of a story as words can. Who am I to tell you that you can’t utilize these as well? Q: I don’t really want to fill up my blog with photos. Can I participate and utilize photos as a part of my post to count? A: For sure. Images don’t always convey everything you want to write, and sometimes you don’t want to make images the focus of a post. You are more than welcome to count images that you include as a part of a post! A: There is no need to take new shots, so feel free to use some older ones if they fit the theme or tone of what you’re going for!